The beauty and wonder of films and animation can take you on adventures that go well beyond a story; the composition and construction of the visuals behind what is on the big screen are obviously paramount in the delivery of a motion picture, and should evoke a ubiquitous sense of being very much a part of the unfolding feature. They are an escape from the redundancy of life. Film is a beloved, magical art that is ever evolving, always expanding with new innovations and technology, and continues to capture humanity’s heart after decades of uncanny and spellbinding amelioration. I give credit to Ben Tillmann on being what I like to call an expert on the subject. Truth be told, I also give him credit for being one of the most multi talented and adventurous individuals I’ve ever had the pleasure to meet. A few of his credentials include lighting and composition for numerous animated films (a personal favorite of mine being the Tim Burton and Timur Bekmambetov produced animated film 9). And whether it’s racing competitively with the Canadian Dragons in Tanjong Beach, Sentosa, to indulging in his penchants for travel and photography, he is an inspiring person who truly is living life to the fullest, utilizing his incredible gifts, and following his dreams. After not seeing him for over a year, I was lucky to be able to spend a day with him during his current visit to Toronto this week, allowing for not only the occasion to catch up with the person who I have affectionately coined my ‘Pen Pal’ –a catch up inevitably includes a fair bit of fun, an equally fair amount of eating, and a venture to the cinema–, but also allowing for the opportunity to relay to all you Nina Spade Studio Fans his Spade On The Street segment. Thank you Ben for your contribution to the Spade Blog. Continue to inspire those you encounter in life with your vivacious and artistic spirit. …And that I am constantly learning and becoming better at what I do on a daily basis. ……And that I get to use both sides of my brain. Okay, there are lots of reasons why I do what I do for a living. Most of it has to do with the fact that I’m still a kid at heart and even though I’m not telling my own stories, or in complete creative control of the projects I work on, I do get to be part of a team that creates worlds. Worlds which have the potential to inspire the imagination of children, both young and old, on a daily basis, in all corners of the earth. It can be pretty staggering and humbling when I actually sit down and think about it. I also get to work with bleeding edge technology. So bleeding edge that when I’m not troubleshooting tools/proprietary software designed by our studio, I’m testing the possibilities of new tools from other companies months before they’ll hit the general population. It forces me to constantly be evolving as an artist and pushes me to be better today than I was yesterday and even better tomorrow. It also has me constantly switching between left and right brain thinking so I don’t have to abandon the technical and problem solving side of life which I get a kick out of to fully pursue my artistic dreams. Now would probably be a good time to mention that I’m a visual fx artist (lighting TD/compositor/surfacing artist) for ILM/LucasFilm working in their feature division. These days, when I’m not at work, I’m most passionate about my photography. Especially when I’m on vacation. I don’t buy souvenirs. They don’t actually represent the emotions I’m feeling or the emotions of the location I’m in. You can’t reduce a person or a sunset or an ancient buddhist temple down to a piece of plastic. It’s just not possible. Especially in Asia where every market seems to have the exact same souvenirs on display outside of stand after stand after stand. Even a photograph doesn’t capture the true beauty of the moment, but at least it can capture a small taste of what I was feeling or what my subject was going through at that exact point in time. And I’m getting better with each picture I take too. Maybe one day I’ll actually be able to snap a photo and think to myself, ‘yes, this is the entire moment, encapsulated in a single frame of time’. Moving to Singapore forced me to quit my band and, in an instant, leave that entire world behind me. It was one of the hardest things I had to do when I moved out here Music is an intricate part of my life and has been for as long as I can remember. I have no idea how old I was when my parents signed me up for piano lessons, but I can’t remember a time when I couldn’t play. Although I no longer get the adrenaline kick I got from entertaining a room full of strangers — or an empty room with a single person, depending on the night — I still play bass and guitar several times a month, usually after a long day at work, or during a rare lull on weekends, to escape from whatever is currently holding me down in reality. Losing myself to rhythm and chords and sound and not having to think, but rather just do is almost more rewarding than any of my other artistic releases. Plus, I’ll occasionally be lucky enough to have a friend or two within earshot that I get to entertain as a small added bonus. What Does P.L.U.R. Mean? 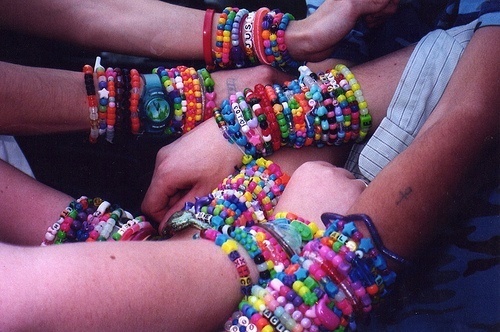 – A Perspective On EDM Culture, And It’s Pervasive Moto. 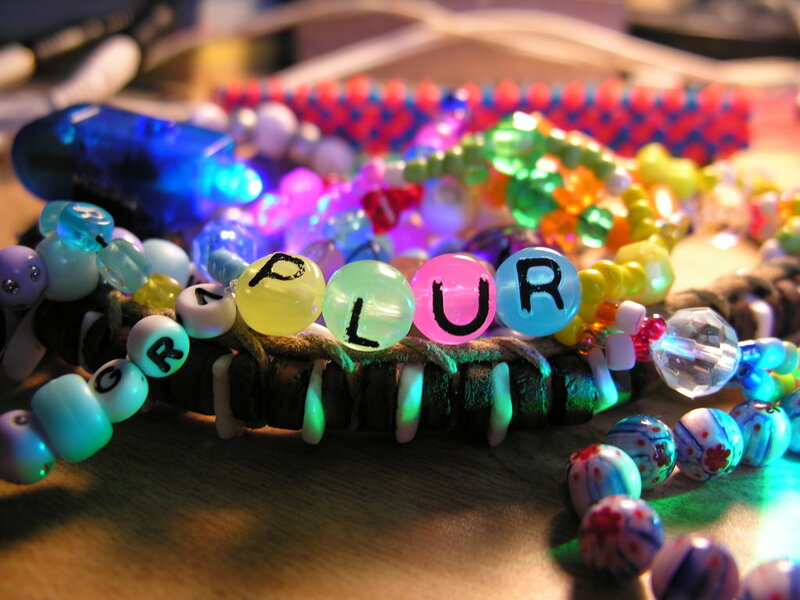 Peace, Love, Unity, and Respect, the respective definition of the compendium PLUR, is a motto coined by a generation of people with an affinity for EDM culture. A quintessential dance party is a pageant in unto itself, littered with young people in elaborate, hand-made, brightly coloured costumes, jewelry (otherwise known as Kandi), floral crowns, toutous, and sunglasses. Themes can be seen. Some as recognizable as unicorns and superheros. Some themes stretch the imagination, such as Steam Punk, garden gnomes, and even Toronto Mayor Rob Ford. Nevertheless, it is a spectacle to see and a sensation to not soon forget… marinating in a sea of fun fur and day glo. I was tickled this week to do a bit on this phenomena. What prompted this animus was the recent and very sad deaths of two VELD patrons, and the hospitalization of 13 others during the massive dance festival last week. What also prompted me to write about it was witnessing both the public’s reaction to it, as well as people I have encountered personally. Hosted in Toronto, VELD accommodates a staggering 50,000+ electronic dance music fans from literally all over the globe to celebrate EDM culture. An aspect of EMD culture that some of it’s participants engage in, is the consumption of alcohol, and the use of empathogenic and psychoactive drugs, such as cocaine, cannabis, and the amphetamine MDMA (also called Ecstasy, E, or Molly). MDMA, particularly, is a drug said to evoke feelings of euphoria, and increase the user’s energy, as well as empathy towards others. Because of EDM culture’s high-paced music festivals, and it’s PLUR maxim, MDMA has been the most popular stimulant experimented with at these concerts. It was unfortunate to hear of the deaths of Annie Truong-Le, 20, and Willard Amurao, 21, who both were said to have taken an unknown substance which killed them and had 13 others hospitalized. Both of them were young, and according to many other articles pertaining to this story, both were good people. Smart people. Kind, courteous, and ambitious. I was sympathetic towards a lot of the criticism that was received by this tragedy, and understood where the negative responses to it had seeded from. And yet, I was also taken aback by it. When unfortunate things such as this happen, I feel that it is strongly because of minimal understanding and education behind the use of drugs and alcohol, and that when these things occur, it has little-to-nothing to do with the overall intelligence or acumen of the victims, precisely when their judgement is already impaired or compromised. These otherwise intelligent people made a choice that they themselves did not conceptualize would result in such a detrimental consequence. To assert that these human beings were asking for it, that they were stupid, and that they were dumb, is profoundly naive. They were human beings who made a terrible mistake. It is hugely disheartening to me to not only witness others judge this so harshly, but ultimately to hear those who themselves are advocates and partakers of EDM culture (a ‘tribe’ encouraged and inspired by PEACE, LOVE, UNITY, AND RESPECT) express what I perceive to be a disappointing insensitivity towards the victims, going so far as to assume that there was 100% crystal clear coherence behind their decision, and therefore, they are “degenerate”. They are “losers”. Or, most unkindly, that they are “E-tards” (an offensive term that refers to someone with an MDMA habit that borrows a disrespectful appellation from people with mental disabilities). This is what I find most disappointing of all; The choice few who have forgotten to be compassionate towards this tragedy… the ones who understand that whole aspect of PLUR. Those two people who were lost had families and friends who are now survived by them, and are naturally suffering because of that loss. Should we not be more sensitive towards that? Should we also not be in support of one another? This is a mass that is cognizant to the nature of human; they are accepting of everyone, showing kindness and support, and demonstrating true recognition of others, finding common ground and being influential advocates of good will. I would hope that those who are so quick to judge find themselves in a fortunate position to discover their own unique way of understanding the beauty behind the PLUR motto, and promote an alternative response to this adversity with something that is constructive. What exactly is PEACE, LOVE, UNITY, and RESPECT? Well, for one, I believe that all four of them are are fundamental ingredients to a good life for yourself and for others. I think that to embody these qualities yourself is just as important as seeking to find them in others. I firmly believe that we are all capable of all four of these beautiful attributes, despite our flaws and insecurities. And I firmly believe that these things can’t technically exist ulterior to yourself, unless you believe in these attributes for yourself first and foremost. 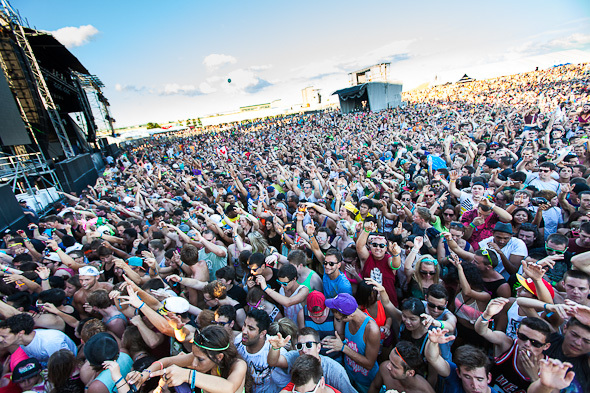 To EDM patrons, it is a mindset which aids in the manifestation of fun! You meet strangers and connect with them. You dance with them, you get to know them, you accept them. Watching two people exchange Kandi bracelets for the first time in my life while attending this concert made me smile from ear to ear. It may seem incredibly cheesy, but I found it to be heartfelt. This is then usually followed by a hug and then the creation of a conversation. How can you not love that? I had a fantastic week this week. Perhaps it was because I was feeling the PLUR. I was also very much motivated to share that same feeling. Of course, there is power in numbers, and so I asked some the ART BEAT participants if they would help me out. PEACE, LOVE, UNITY, and RESPECT are all equally important, however I asked those who participated to choose two out of the four and tell me what made them especially important. I loved each response. We all must remember to practice kindness in our everyday lives. The ‘Grind’, as I like to call it, can easily get in the way, sometimes allowing us to forget to chose our words better, and speak of others more kindly. It is easy to forget to do that… to speak and act with respect… at those times that, perhaps, we ourselves are feeling vulnerable and insecure, angry or stressed out, a little bit threatened by life, or scared to lose what we love. And sadly, it is even possible to be intentionally hurtful, mean, and even malicious when we’re feeling guarded, putting our life on hold in an attempt to cause others pain. However it is so vital to emulate that which you seek for yourself. Being kind, believe it or not, takes courage sometimes. Be mighty. Hold onto joy. Always stand up to those who are unkind and stand up for those who may not have the voice to. Most importantly, lead by example; show peace towards those who are unkind. They’re usually fighting a hard battle within themselves. People like that need peace the most. And to those people, I only want to share with them mutual respect, understanding, and well wishes that we all just once and for all be good to one another. I would imagine…. that the families of those who passed away and even to those who were hospitalized received more support, understanding, and love than they did negativity and a lack of understanding. When times of turmoil arise, the true of heart and the kindest of the kind are the first ones to give their love, support, and positive words and actions. While attending the concert and witnessing this outpour of truly genuine connection, I found myself inspired by it. I wanted to remember the all-natural euphoria that I felt that day, dancing with a treasured friend and wonderful strangers alike. There was a moment in which a combination of beautiful colours (Navy, Red, Aqua, Ivory, Peridot, and Gold) in abstract soft and sharp patterns were being displayed on the screens on stage. I remember thinking how beautiful they were and how complementary, and even ‘in synch’, they were with the moment and everyone surrounding me. From that, I created a piece to never forget that moment. And although it looks nothing like Kandi… it is a small but sincere tribute to that day, to the friends and families who lost their loved ones, and to all those seeking to both give and get a little PLUR in this big old show we call life! Drugs and alcohol abuse can alter and deteriorate the lives of both their users, and their family and friends. There are way in which you can help to increase awareness in order to support those affected by drug and alcohol abuse.